Size: All maps about 7.5 x 10 inches. 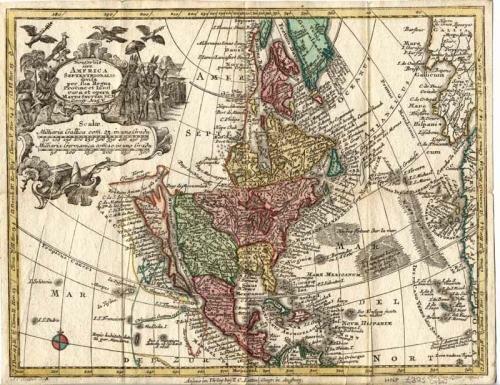 Seutter's very detailed and decorative maps of the continents from 'Atlas Minor' published by Thomas Lotter, Augsburg, c.1750. 1) 'Novus Orbis sive America Septentrionalis divifa per fua Regna Provinc et Insul'. 2) 'America Meriodonales per fua Regna Provinc ...juxta obfervation et defcript recentis'. Seutter's very detailed and decorative map of Asia with an interesting depiction of Japan. A beautiful reduction of Seutters large map of Africa from 'Atlas Novus'. This smaller map appears to have lost none of the detail of it's larger predecessor. A detailed engraving of the European continent with a wealth of information. The maps are in very good condition with original wash and outline colour. North America has some minor folds as issued.